The drone market is technologically innovative and fast-growing. Part of that growth is due to the fact that the drone market actually cuts across several market sectors, from billions of dollars in defense contracts to the ever-expanding consumer electronics and RC toys market (which is what we cover here on the site) and commercial contracts in areas like agriculture, real estate, photography, and construction. We’ve looked at some of the different studies of the drone market in 2018 and compiled some basic facts to know into a single article. We’re not claiming to know the future – and since we cite several studies (with links), you’ll see that some of the information may be slightly contradictory! Different economic models and mathematical analysis will naturally lead to different results, but there’s one thing that everyone seems to agree on, which is that the drone market is growing at an exponential rate and is only going to continue to grow in the coming years. Drones are quickly becoming a popular tool that companies are using to add efficiency and accuracy in their businesses. Teaching a team how to use drones to grow your business is easier than ever with great programs to become FAA-Certified. 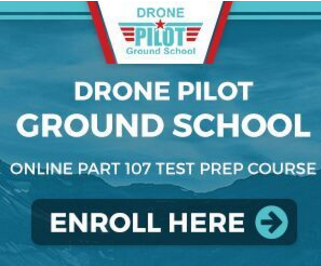 UAVCoach.com offers an online program, Drone Pilot Ground School, and it’s the best way to get you and your team certified. $50 off the UAV Coach Training Courses for Dronethusiast Readers! This course not only comes with a full learning curriculum but also provides you with the latest news and in-depth updates on drone-related laws. Once enrolled in the course you will learn the 127 knowledge concepts required by the FAA published in the UAS Airman Certification Standards. Along with this, there are over 30 text and video lectures with support from your instructor via phone or email. Other features include practice quizzes to test your learning and downloadable PDFs for offline study or sharing lectures with your team. As the drone market continues to be innovating and growing across markets, becoming FAA Drone Certified is a great way to grow your company and help you and your team become more efficient. We will begin by discussing the definitive state of the drone market in the present day. A recent report from Goldman Sachs predicts that the total spending on drones worldwide will be over $100 billion by the year 2020. The defense sector remains the largest area of spending and is expected to spend a total of over $70 billion on drones between 2016 and 2020. The second biggest area of spending, at $17 billion, will be the consumer market (members of the public buying their drones from DJI and other major manufacturers). However, the commercial drone market is quickly expanding in 2018. Two industries dominate the projected spend with 80% share. 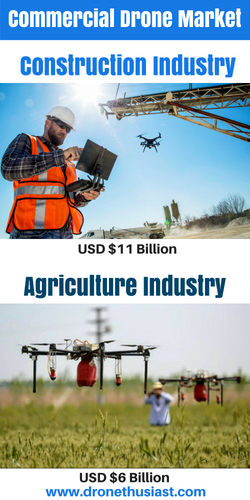 The first, construction, is the biggest industry sector at $11 billion USD, covering a very wide area of work including inspection, maintenance, surveying and mapping. Drones are used in construction because specialised equipment is required for a lot of this type of work. For example surveying large areas very accurately may require a fixed wing aircraft and ground control points or an RTK receiver. The second biggest area of growth is predicted to be agriculture at $6 billion. The growth here will be driven by precision agriculture, a part of which traditionally has been carried out using satellite imagery, or by handheld or tractor mounted sensors. You’re not going to find cheap drones in the AG sector. The data gathered and analysis carried out is then used by variable rate technology on equipment such as seeders and sprayers. Drones are now another option for farmers to capture NDVI imagery, and have been able to capture and process maps quicker than satellites. As for construction specialist equipment is required, mainly a multi spectral camera and then the software to map the farm. For larger farms fixed wings also become a viable option. The use of drones commercially is growing and maturing quickly, and at the same time we are seeing a huge growth in the number of licenced pilots. It will be hard going for these pilots to make a career commercially without specialising and moving above and beyond basic photography and videos. How much is the drone market worth? In 2016, the global drone market was worth $4.5 billion USD (according to Business Insider). By the end of the 2017 financial year (the most recent information we have, obviously) it was worth $17.82 billion. 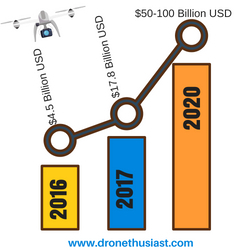 If this shocking trend continues (and depending on whose numbers and analysis you trust most) the drone market is expected to be worth between 50 and $100 billion by the year 2020. As stated above construction and agriculture are two major areas of drone market growth that pilots should definitely consider moving into if they want to make a lot of money flying drones. This will require two things: firstly, developing the qualifications and training for an industry-specific skillset. And secondly, buying the necessary equipment required to complete the job effectively. In terms of the wider implications of the future of the drone market, the amount of money spent is predicted to grow but the percentage of the market captured by each sector will probably stay the same. Commercial drone use and enterprise drone use (which refers to the consumer-level drones we mostly talk about here) are already up from last year and will make up about 31.3 percent and 51 percent of the drone market, respectively. In terms of individual companies, DJI is likely to continue to reign supreme well into the future of the drone market. 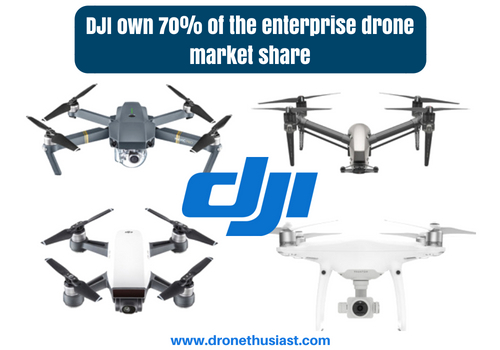 They currently own 70 percent of the enterprise drone market share, and with the impending release of the Mavic Pro 2 and the Phantom 5, there’s no reason to believe that number will drop by any significant measure any time soon. Making drones with all the latest innovations is simply too expensive for anyone else to break into the market at a competitive price point. However, new drone companies are popping up all the time and finding success with a new strategy: filling different niches than the ones being pursued by DJI. Altair Aerial, for example, makes some of the best beginner drones around and has captured a different share of the market than the people who are interested in DJI’s professional high-end models. You can learn more about Altair and other up-and-coming drone companies that are shaking up the market in this article. We hope you’ve learned a bit about where the drone market is at in 2019 and where it’s heading in the future. This is a fast-growing and exciting industry to be in right now, and a smart investment for any business owner or broker. And if you’re just a regular ol’ hobbyist drone consumer like the rest of us, there’s never been a time to get started because there are so many different types of awesome drones for sale!